APIs are enjoying a ubiquitous lifestyle and becoming the main entryway to the digital business. As a software intermediary that makes it possible for programs to communicate with each other, APIs reach across many industries and can dwell in web-based systems, operating systems and databases. Though it's acknowledged that APIs are critically important to business processes, a large number of organizations don’t fully understand the importance of APIs and lack a clear management strategy. Yet many businesses depend on an API strategy to drive B2B integration. 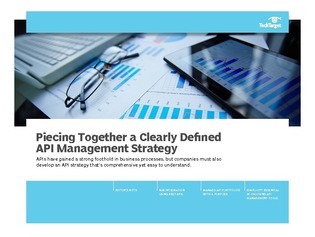 In the first feature of this handbook, journalist George Lawton points to the many challenges in developing an API strategy that includes supporting legacy protocols, streamlining business processes and using third-party data. He assesses the shift toward making APIs a critical part of B2B integration and examines the associated security and compliance concerns. In the second feature, consultant Tom Nolle writes that enterprises are failing to set proper goals when developing an API management strategy. He says organizations are reporting that some of their in-house and acquired application services are uncontrolled, and even where API controls are in place, they aren't supporting at least some of their IT goals. In the third feature, technologist Kurt Marko emphasizes the importance of keeping it simple when managing both on-premises and cloud-based APIs.